I’m a pretty big fan of kimchi. Despite its bad rap from odor, I find it refreshing and tasty, especially partnered with some good Korean food. Also, good a source of probiotics (those things also found in yogurt you always hear Jamie Lee Curtis talking about that help you if you’re “feeling irregular”). 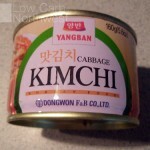 I have never seen a canned kimchi. Glass jar yes, but no can. The can showed me brightly colored photos and promising text, but no guarantees of what was inside. After reading the list of ingredients, images of delicious kimchi filled my mind. Leeks! Onions! Cabbage! It was not meant to be, however. 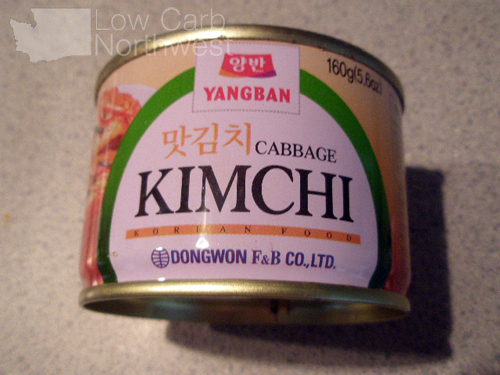 Sadly, the prospect of eating canned kimchi was not as exciting as I had hoped. Opening the can revealed a packed mass of monotonously colored cabbage mass. The cabbage was pretty mushy instead of nice and crispy though it had a good amount of spiciness. This is the kind of kimchi you eat when you’re holed up in your fallout shelter during the apocalypse and it’s the only thing you’ve got. Excuse me while I get my lead vest. This entry was posted on Monday, January 3rd, 2011 at 6:00 am	and is filed under Food. You can follow any comments to this entry through the RSS 2.0 feed. Both comments and pings are currently closed.